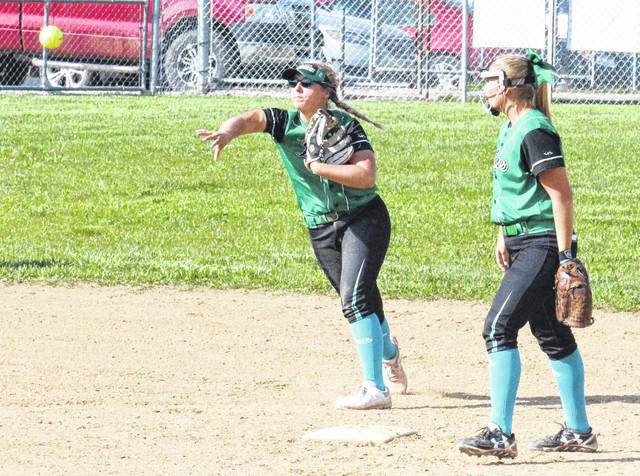 Eastern senior Sidney Cook (left) throws to first base in front of teammate Cera Grueser (right), during a non-conference softball game on May 7 in Tuppers Plains, Ohio. Eastern senior Sidney Cook was the Ohio Valley Publishing area’s lone selection to the 2018 Ohio High School Fastpitch Softball Coaches Association all-state softball squads, as voted on by member coaches in the Buckeye State. Cook, the power-hitting shortstop for the 17-7 Lady Eagles this spring, blasted 11 home runs, to go with three triples and 17 doubles — all career-highs. With 43 total hits, she finished with a .566 batting average, while scoring 36 runs and driving in 40. Cook — a Blowing Green State University signee — was named to the Division IV honorable mention portion of the All-Ohio list. It’s the third time in her career that she’s been an All-Ohioan, as she made the second team as a junior and honorable mention as a freshman. Gallia Academy, Southern, River Valley, Meigs and South Gallia did not have a player chosen in their respective divisions. Pitchers: Kara Gunter, Granville, So; Kelsey Byers, West Branch, Sr; Sydney Campbell, Keystone, Jr; Ashley Riley, Oak Harbour, Sr; Carly Turner, Keaton Ridge, Sr.
Catchers: Tigan Braskie, Lakewood, Jr; Kameron DiMarzio, Steubenville, Sr; Autumn Acord, Keystone, Jr; Leah Boggs, Madison, So. Infield: Maddie Dryden, Indian Valley, Jr; Avery Steiner, Lakeview, Sr; Raylene Hammond, Jackson, Sr; Cassie Cromwell, Greenville, Sr.
Outfield: Lindsey Potter, Jonathan Alder, So; Sophia Pressler, Bellevue, Sr; Taylor Pagan, Sheridan, Fr; Faith Hensley, Monroe, Sr.
Pitchers: Kylie Coffelt, West Branch, Sr; Sloan Kiser, Madison, Sr; Madison Bryant, Graham, Sr; Jenna Robbins, Northwestern, Sr.
Catchers: Maggie Moore, Jefferson Area, Sr, Chloe Wohlgamuth, Shawnee, Sr.
Infield: Emily Walker, Jonathan Alder, So; Gracella Dunlap, Riverview, Jr; Alexis Renner, Dover, Jr; Macy Allen, Columbian, Sr; Sarah Moats, Circleville, Jr; Kelsey Carter, Clinton-Massie, Jr.
Outfield: Meredith Thomas, Big Walnut, Sr; Megan Davis, Lakewood, Sr; Madi Nunez, Keystone, Sr; Erika Johnson, Akron Springfield, Sr; Kalicia Doles, Waverly, Sr.
Kami Kortokrax, Bishop Hartley; Halle Garman, Granville; Parker Steck, Highland; Shelbee Stridom, Carrollton; Rylei Miller, Maysville; Maris Barbato, Youngstown Ursuline; Delaney Rito, West Branch; Olivia Whitecar, Holy Name; Sarah Shearer, Norton; Murissa Drown, Clyde; Emily Lenke, Oak Harbour; Lyndsey Seamon, Bellevue; Shayla Munyan, Fairfield Union; Mariah Ridgeway, Jackson; Nicole Rawlings, Badin, Morgan Gilbert, Greenville; Dana Anderson, Alter. Pitchers: Casey Burke, Cardington, So; Hannah Smith, Buckeye Trail, Sr; Allison Smith, Champion, So; Kennedy Hickey, Ashland Crestview, Sr; Ashley Hitchcock, Eastwood, Jr; Sydney Studer, Colonel Crawford, Sr; Kasey Murphy, Coal Grove, Sr; Carley Wagers, Williamsburg, Sr; Kelsey Day, West Liberty Salem, Jr.
Catcher: Amber Cieplinski, Waterloo, Jr.
Infield: Avery Clark, North Union, Sr; Taylor Heckman, Utica, So; Meg Otte, Sandy Valley, Sr; Meghan Turner, Champion, Sr; Maddy Dyer, Eastwood, Sr; Boo Sturgill, Wheelersburg, Fr; Brooke Webb, Chesapeake, Sr.
Outfield: Courtney Seevers, Milton Union, Jr.
Pitchers: Shelbey Spurlock, Otsego, Jr; Kaitlin White, Fairfield, Jr.
Catchers: Hannah Smith, Garfield, Jr; McKenzie Cremeens, Ironton, Sr.
Infield: Dani Hall, Bishop Ready, Sr; McKenzie Bump, Mt. Gilead, So; Madie Legg, Northridge, Jr; Madison Steiner, Garaway, Sr; Sarah Powell, Barnesville, Sr; Madison Hoiles, Elmwood, Fr; Avery Rumer, Bluffton, Jr; Caitlyn Brisker, Oak Hill, So; McKinlee Ruppert, Dixie, Jr; Jenna O’Hair, Middletown Madison, Jr.
Outfield: Erika Bell, Manchester, Sr; Kiera Frascone, Tuslaw, So; Erin Diem, Patrick Henry, Jr; Faith Golden, Williamsburg, Jr.
Abby Davis, North Union; Baylee Adams, Cardington; Brooke Roberts, West Jeff; McKenzie Morrison, Edison; Ariana Ott, Sandy Valley; Cassandra Bacon, Springfield; Kennedy Kay, Norwayne; Madison Weaver, South Range; Carson Crowner, Clear Fork; Haylee Dominique, Paulding; Leah Johns, Patrick Henry; Kara May, Spencerville; Abby Howard, Alexander; Emily Robinson, Westfall; Zoe Doll, Minford; Maggie Kersting, Seven Hills; Camryn Olson, Cincinnati Hills Christian; Taylor Boeckmann, East Clinton. Pitchers: Abby Jarvis, Mathews, Sr; Sydney Long, Hillsdale, Sr; Haley Hawk, Parkway, Sr; Carly Helmstetter, Monroeville, Jr; Faith Brown, Valley, Sr; Skipp Miller, Bradford, Sr.
Catcher: Becca Miller, Hilltop, Sr.
Infield: Taylor Duncan, Danville, Sr; McKinley, Alberts, Danville, Jr; Gina Fogle, Toronto, Sr; Kaitlyn Weaver, Shadyside, Sr; Katelyn Kennedy, East Canton, Sr; Hailey Niederkohr, Carey, So; Quinn Slattman, Tinora, Sr; Shaelyn Vassar, Portsmouth Clay, Jr; Kylee Fisher, Newton, Sr.
Outfield: Ashlyn Tommas, Monroeville, Sr; Taylor Webb, Symmes Valley, Sr.
Pitchers: Emma McCracken, Newark Catholic, Jr; Zoey Thomas, Strasburg, Jr; Blayc Hacker, Carey, Sr; Teyah Sautter, Columbus Grove, Sr; Katelyn Weinandy, North Baltimore, Sr.
Catchers: Danielle Bame, Columbus Grove, Jr; Sydney Newland, Ada, Sr; Cassie Schaefer, Portsmouth Notre Dame, So; Denise Young, Waterford, Jr.
Infield: Kylie Daugherty, Frontier, Sr; Bailey Drapola, Brookfield, Jr; Kendyl Switzer, Bristol, Jr; Madisyn Gossard, Ada, Sr; Katie Osburn, Belpre, Sr; Kristin Davidson, Riverside, Sr; Sidney Jackson, Tri County North, Fr. Outfield: Paige Laughlin, Berne Union, So; Autumn Oehlstrom, Lisbon David Anderson, Jr.
Kaitlynn Briggs, Danville; Payton Hartshorn, Granville Christian; Candace Caldwell, River; Brooklyn Ruble, Bridgeport; Kaylee Cline, Hillsdale; Ashley Schott, Canton Central Catholic; Alivia Oulton, Mathews; Kristin Coleman, New Riegel; Libby Henderson, Gibsonburg; McKenna Ray, North Baltimore; Abiail Schroeder, Miller City; Bailey Strickler, Parkway, Aubrey Wyse, Hilltop; Sidney Cook, Eastern; Madison Pierce, Peebles; Julie Swain, Portsmouth Clay; Francys King, Mechanicsburg; Paige Vilvens, Fayetteville-Perry.